This collection of silhouette bird oval sticker designs are a perfect way to show you are a birder! 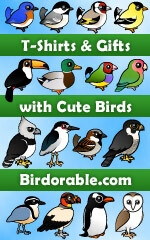 Several different designs are available so you can pick your favorite type of bird. From shorebirds to passerines, from extinct species to familiar backyard birds, you're sure to find the quintessential bird to represent your own birdwatching passion! Oval bird sticker designs are also available on a full variety of apparel, gifts and accessories. A Snowy Owl comes in for a landing (or is about to take prey). Great oval stickers & more for birders. A beautiful silhouette of a grand Great Blue Heron or other heron or egret on oval stickers, apparel & more. The Northern Cardinal silhouette on this oval sticker design lets everyone know you love birds. Unique birder oval stickers and other swag to show the world you are a birdwatcher. Fan of Whooping Cranes, Sandhill Cranes or other crane species? This bird-themed design is for you! The unmistakable silhouette of the most famous extinct bird species is shown on this oval design. Common gull, rare gull, Kittwake, Jaeger, maybe even albatross? A great sea bird silhouette for birders. Great birder stickers with a Roadrunner silhouette. Leave no doubt you are a birder! Pelicans have such distinctive, unmistakable silhouettes. Everyone will know you love birds w/ this design. A Swift flies through the air on graceful wings. Original swift bird oval stickers & more for birders.